Transform the look of your home with a stunning new floor. Perfect for any room in the house, hardwood floors deliver durability, unmatched beauty, and distinctive charm. Even if you plan to sell your home, wood flooring still has a compelling benefit. It increases the value of your home, making it more appealing for buyers and more profitable for you. 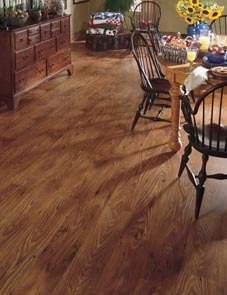 A drab old home can become a showplace with the right type of wood flooring as well as luxury vinyl tile. Besides its durability and beauty, hardwood also has the benefit of being relatively low maintenance. Keeping a hardwood surface clean doesn’t require much more than routine sweeping and mopping. Furthermore, hardwood flooring is resistant to staining and water damage. Although wood can be scratched, scuffed, and dented, these imperfections can be erased by simply sanding and refinishing the floor. There is rarely any need to completely replace a wood floor thanks to refinishing. Talk to our sales associates to find out more about the advantages of hardwood. Hardwood floors can be divided into two major categories: solid and engineered. As the name implies, solid hardwood is made completely from genuine wood in one solid plank. Engineered hardwood, however, is specially constructed using different layers of wood that are pressed together into a single plank. Both types have their own advantages and drawbacks. Solid planks offer an unmatched, distinguished character. You will feel great knowing that your home’s floor is genuine wood from top to bottom. In addition, solid planks tend to be thicker than engineered planks. This means that they can be sanded and refinished many more times, extending their already lengthy longevity. However, solid variants also tend to be more costly than engineered types and are more sensitive to changes in humidity and temperature. Engineered hardwood flooring is specially constructed to last. Thanks to their special construction, these planks do not expand and contract as the humidity and temperature levels fluctuate. Furthermore, from the surface engineered products are virtually indistinguishable from solid types and offers the same natural beauty at a slightly lower price. To determine whether solid or engineered hardwood flooring is the right choice for your needs, talk to our sales associates. You may find that a different flooring type such as laminate flooring would be a better fit for your project. The quality of your engineered hardwood flooring installation is as important as the quality of the floors you purchase. Because we specialize in the trade, we make it a point to offer certified installers for this critical part of your floor upgrade. Simply schedule a day for installation, and we do all of the work. From flooring delivery to installation to job cleanup, we offer prompt service as well as guarantee our work and your complete satisfaction. Rest assured that our professional approach to flooring installation service is affordable when compared to the rates offered by others. We offer competitive rates, so our customers can enjoy as many fruitful years as possible with their new flooring purchase. Plus, our work is guaranteed, so you never have to second-guess your decision to work with our proven installation team. You can protect your investment with our installation crew, and guarantee the looks and longevity of your new floors. Build a home your family can be proud to call their own. If you have grown accustomed to the neighborhood you live in, but you need a change of pace, make an investment in new hardwood floors from some of the most notable manufacturers in the business. Save a great deal of money on floors from brands like Floorcraft and Downs, and make your home an impressive example for the rest of the neighborhood. Contact us today to save a great deal of time and money on your next project with our hardwood flooring and hardwood flooring installation. We proudly serve customers in Kalamazoo, Portage, Mattawan, Schoolcraft, and Plainwell, Michigan, and surrounding communities.